Darwin Aboriginal Art Fair Foundation’s executive director on how far the event has come in its 12 years, and where it will take us in the future. I was privileged to spend almost eight years living in the remote Arnhem Land community of Maningrida. It was here I was introduced to the phenomenal world of Art Centres. I was so humbled to work alongside great names like John Mawurndjul, Johnny Bulunbulun, Samuel Namunjdja, Kay Lindjuwanga, Marina Murdilnga, Owen Yalanja and Ivan Namirrkki (and many others). I had entered a new world. Maningrida was a place where some 12 languages were spoken, with English a distant 13th. As a new Balanda (non-Indigenous person) in the community, I was warmly welcomed. The children were the first to shake my hand and ask: “What’s your name? What’s your skin?”. After a short time, the men let their guards down, too. It was however, the women whose respect and trust were the hardest to earn. Maningrida was considered a patriarchal community. The men were the key decision makers. The women, however, ruled the roost. After five years working at the Art Centre, I was invited to manage the Bábbarra Women’s Centre by its artists and staff. Bábbarra hosted seven different micro businesses, with its crowning jewel being Bábbarra Designs, a textile workshop. It was here that yet another pair of my rose-coloured glasses were removed. I was suddenly exposed to the world of the women. I saw their lives at a deeply personal level. The more I understood of their language, the more insight I suddenly had into the implications that Western influences have on their culture and family life. I had the honour of working with artists such as Susan Marawarr, Jennifer Wurrkidj, Deborah Wurrkidj, Janet Marawarr, and the late Helen Lanyinwanga. They are not social activists, doctors, or lawyers. But they are cultural warriors – preservers of language, traditional practice and custodians of sacred stories and ceremony. They are also the strongest women I know. DAAFF wishes to reflect this strength in celebrating the fair’s 12th year. It has prepared a public program of traditional dance performances, artist workshops, children’s activities, film, fashion, food experiences and music. It will also represent a record 75 Art Centres. There are new participants from the Northern Territory, including Barkly Regional Arts and Bindi Mwerre Anthurre Artists, as well as walantanalinany palingina artist collective from Tasmania. 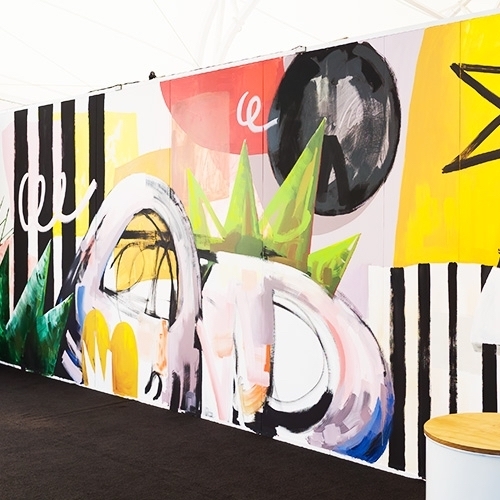 The fair will command all four exhibition halls at the Darwin Convention Centre, brought to life with the vibrant and diverse artwork of more than 2,000 artists. The DAAFF Indigneous Curators Program and Symposium returns to connect Australia’s First Nations curators with Art Centres and their arts workers. This program has been made possible by the Tim Fairfax Family Foundation, with support from the INPEX Ichthys Project. This program will provide a platform for industry and cultural discourse, mapping the future direction of Aboriginal Torres Strait Islander art and how it is exhibited. DAAFF is presenting two performances of From Country to Couture: the DAAFF 2018 Fashion Show. 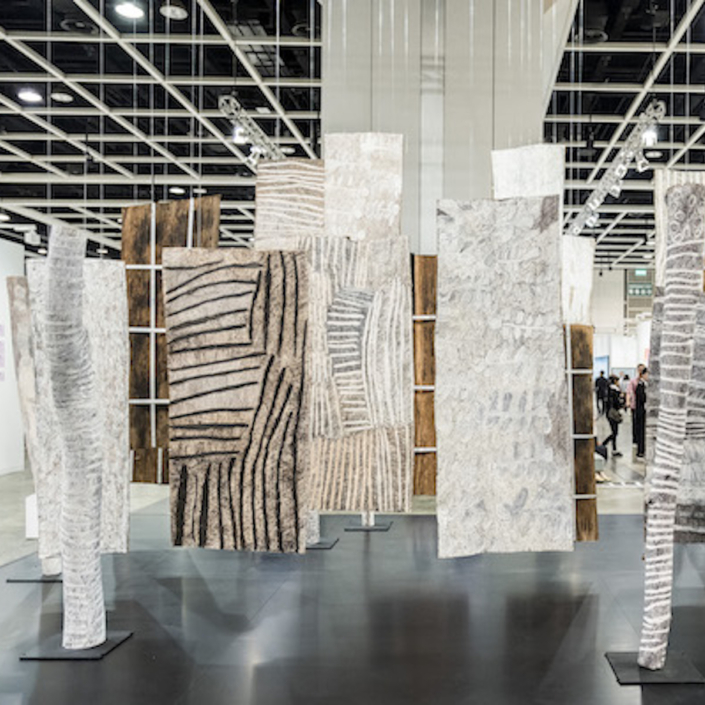 13 Art Centres will present their collections in the cutting-edge runway event. Fresh from directing the Intertwined fashion performance on the Gold Coast, Grace Lillian Lee is back as creative director of the show. Lee and her team will bring the exquisite textile and fashion designs being produced by remote community Art Centres to life. DAAFF’s fashion show is the centrepiece of the Foundation’s deeper research and development into the Indigenous fashion industry. In 2017, DAAFF acknowledged the 50th anniversary of the 1967 Referendum granting Indigenous peoples the right to be counted as Australians for the first time, and the 25th anniversary of the 1992 Mabo High Court judgement. These were two watershed moments in Indigenous-Australian history. This year, DAAFF wants to share some of the amazing stories and projects from Indigenous Art Centres and artists across Australia. 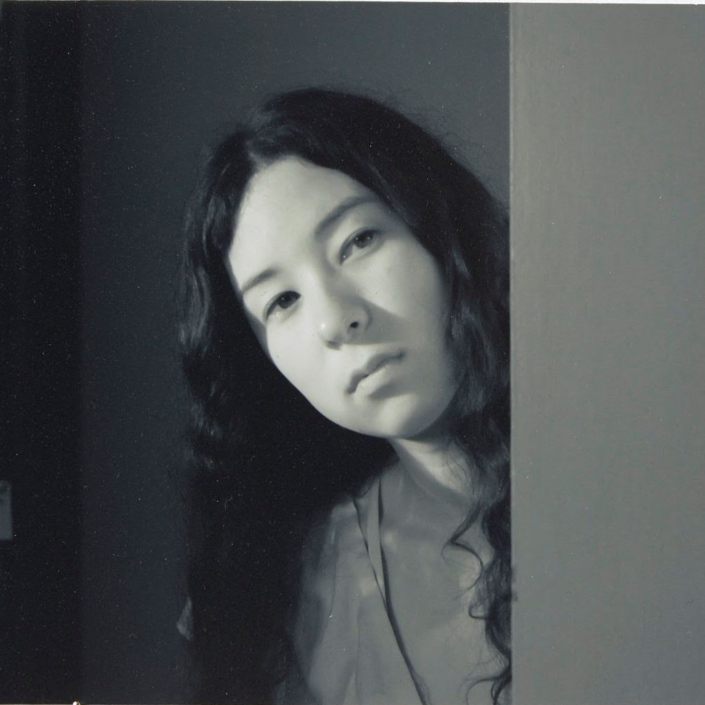 The fair welcomes everyone to engage with the artists and their Art Centres from more than 75 communities. We want visitors to take advantage of everything the event has to offer, and to meet some of Australia’s cultural warriors in person. For it is through rich and intimate interactions that we, both Indigenous and non-Indigenous, can forge the path to reconciliation. This article was first published in the 2018 Art Collector / Darwin Aboriginal Art Fair special edition. 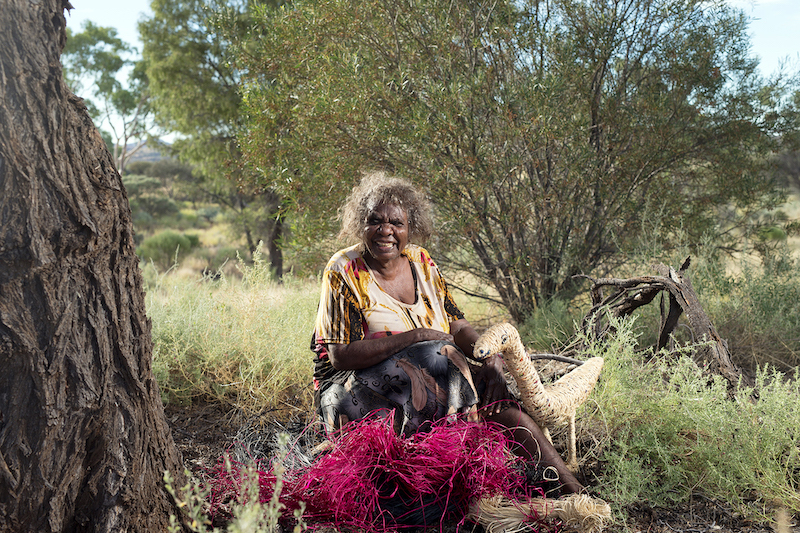 Image: Tjanpi Desert Weavers artist Niningka Lewis with Tjulpu. COURTESY: TJANPI DESERT WEAVERS, NT.